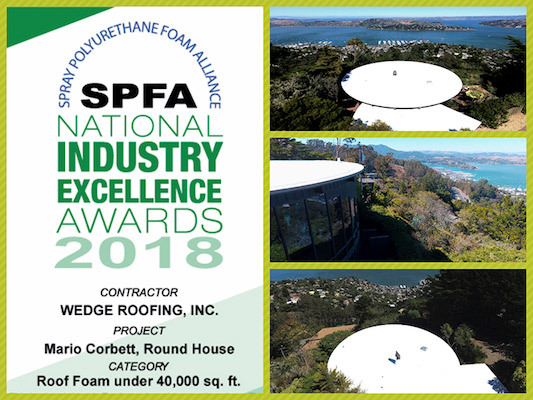 The spray foam roof installed on a Marin County landmark home by Wedge Roofing has won the 2018 First Place Award for Best Spray Foam Roof Nationwide from the Spray Polyurethane Foam Alliance (SPFA). This is Wedge Roofing's fourth consecutive year, and the second Marin County roof to receive the first place SPFA award for Best Spray Foam Roof Nationwide. The San Francisco Bay Area Spray Foam Roofing Contractor's previous awards honored a high-tech spray foam roof on a Marin County Eichler home, a technically challenging foam roof on a Sonoma County manufacturing facility, and a Solar Spray Foam Roof installation on a San Francisco Bay Area church. Judged by an independent panel of experts, the (SPFA) Industry Excellence awards are considered the spray foam roofing industry's highest honor and one of the most prestigious awards for a roofing contractor. Both technically challenging and architecturally significant, Wedge Roofing's award-winning spray foam roof was installed on a 1954 atomic-era home designed by famed mid-century modern architect, Mario Corbett in the Marin County Headlands. Towering nearly a thousand feet above the San Francisco Bay, perfectly aligned with the south tower of the Golden Gate Bridge, the home offers broad sweeping 160-degree views from the Pacific Ocean to the nine counties of the San Francisco Bay. The circular 45-foot diameter design is an aesthetic and historical memento to a unique period in American culture, when getting to the moon was something to be attempted, and the modern was wanted in the now. To bridge the 1950's era structure with the consistency and dependability of a contemporary roofing system, Wedge Roofing designed a highly-insulating foam roof providing the air-sealing energy-efficient characteristics not available in the original ceiling and roof assembly construction. Sprayed-in-place, the spray foam conforms to the radius of the home, expanding into a solid, seamless membrane sealing the building envelope and eliminating heat and cold syncs. Offering further insulating values, the spray foam was installed directly over the existing roof, mitigating the negative environmental impact of roof removal and providing sustainability with regular roof coatings. Often, the Marin Headlands are consumed by fierce, driven Pacific winds blanketing the area in thick waves of fog rolling over the coastal hills. This San Francisco Bay Area atmospheric condition could be challenging to some spray foam roofing contractors. However, as a certified spray foam contractor with over 41 years of Bay Area roofing expertise, the Wedge spray foam team utilized their unique installation techniques devised precisely for San Francisco fog.